And in the race for governor there, also in the razor-thin majority -- recount territory, rather, Republican Congressman Ron DeSantis leads Democratic Tallahassee Mayor Andrew Gillum by more than 36,000 votes, or .4 percent -- .44 percent. Gillum, who conceded the race to DeSantis on Tuesday night, indicated through his lawyers that they're also gearing up for a fight. Now, Florida has 67 counties, they all have until noon tomorrow to submit their unofficial vote totals. One thing is for sure, It's good to be an attorney for election law in Florida in November. STEVE DOOCY (CO-HOST): Here’s the thing, and this is the reason that Rick Scott has sued Palm Beach and Broward County. Suddenly, mysteriously, apparently Broward County is finding more ballots. Now, how is that? KATIE PAVLICH (GUEST CO-HOST): All of a sudden. PAVLICH: The other issue here, in terms of legal problem, is the early voting numbers that were in on Sunday were -- they’re all supposed to be voted by Tuesday -- or counted on Tuesday by Florida law standards, and yet, here we are getting to the weekend, and those early totals are still being counted in Broward County. STEVE DOOCY (CO-HOST): They were busy. 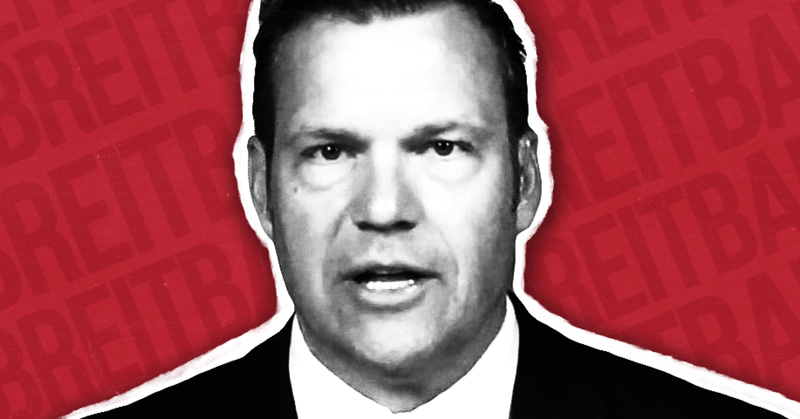 Kansas secretary of state and Breitbart columnist Kris Kobach, who frequently pushes voter fraud misinformation on Fox News, spectacularly failed in his effort to mount a defense for his state’s voter registration law in a federal court trial in March. Federal judge Julie Robinson both struck down the Kansas law and ordered Kobach to take remedial classes after repeatedly violating the judge’s orders, including trying to introduce evidence after Robinson had specifically excluded it. Fox, which has pushed the debunked specter of widespread voter fraud for a decade, provided no coverage of the trial as it progressed between March 6 and March 19. In 2013, Kansas began enforcing the Kobach-backed Secure and Fair Elections (SAFE) law, which required residents who did not have a driver’s license to show proof of citizenship with documents such as a birth certificate or U.S. passport when registering to vote. In May 2016, U.S. District Judge Julie Robinson temporarily blocked Kansas from enforcing the law after the American Civil Liberties Union (ACLU) filed a lawsuit, arguing that the law violated the federal National Voter Registration Act, which requires state voter registration forms to merely “contain an attestation that the applicant meets” eligibility requirements, such as citizenship. According to the ACLU, the law blocked tens of thousands of voter registrations in Kansas. Kobach, who writes columns for Breitbart.com, has appeared on Fox News numerous times; a search of Nexis transcripts, which cover less than half of Fox’s shows, revealed nearly 60 appearances by Kobach. During a number of these appearances, he pushed an anti-immigrant agenda. He has also discussed the Kansas voter registration law at least twice on Fox News. Fox has spent years pushing bunk voter fraud claims and supporting Republican efforts to make voting harder in response to the fear they inspire.Considering that history, one might expect the network to closely cover Kobach’s chance to prove the necessity of stringent voter identification laws. But that hasn’t been the case; according to a search of closed-captioning transcripts on SnapStream and iQ media, Fox mentioned the trial only twice, in two short news updates on March 7, for a grand total of 50 seconds of coverage of a trial that stretched over six days. Day 1: The judge scolded Kobach and his team for improperly trying to introduce new evidence and not knowing courtroom rules. Day 3: Kobach’s legal team again violated courtroom procedure. Day 5: Kobach still had trouble properly introducing evidence, and one of his witnesses repeatedly interrupted the judge. Day 6: Kobach team witness Jesse Richman admitted a racist method for flagging potential noncitizen voters and agreed Kobach’s and Trump’s claim of millions of illegal votes in the 2016 election is baseless. Day 7: The judge said a Kobach lawyer was “being schizophrenic” over failure to properly present witness testimony from a pollster. Kansas Secretary of State Kris Kobach got a tongue lashing Tuesday from the judge who will decide whether he violated federal law by blocking tens of thousands of voter applications. Federal Chief District Judge Julie Robinson, a George W. Bush appointee, accused Kobach of engaging in "gamesmanship" and skirting her orders. In the nearly two years since Robinson ordered him to register those voters, she said, he has forced her and the American Civil Liberties Union to monitor his actions down to the tiniest details in an effort to get him to comply. "I've had to police this over and over and over again," she said. Kobach, who hopes to be Kansas' next governor, asked the judge not to find him in contempt. The Republican candidate argued he doesn't control the county officials who carry out logistics such as sending postcards to voters to let them know where their polling stations are. Robinson, at times sounding livid with the secretary, gave him a dressing-down. "These people are not second-class registered voters," she told him. "You assured me that they had or they would get the postcards." Judge Robinson additionally “sanctioned Kobach with six hours of continuing legal education related to rules of civil procedure or evidence” due to his repeated violations of his rules throughout the trial. As of publishing, there is no word from Breitbart or Fox News on the ruling. The Republican Party has increasingly created and used political microsites designed to look like local news sites as a political tactic. Here’s why that’s bad for democracy. Last fall, Arizona Senate candidate Kelli Ward touted an endorsement from the Arizona Monitor on her Facebook page. Ward’s campaign must have really liked the endorsement because it reprinted it in full on her campaign website. But what is the Arizona Monitor? Is it a local news site? A blog covering local politics in Arizona? Or is it something else entirely? A Politico investigation found that the Arizona Monitor “launched just a few weeks before publishing the endorsement, and its domain registration is hidden, masking the identity of its owner. On its Facebook page, it is classified as a news site, but scant other information is offered.” Inquiries to Arizona politicos didn’t turn up anything either, with some telling the outlet that “they could only scratch their heads” and were befuddled by the site’s background. There’s nothing wrong with a local political blog supporting Ward’s campaign, or Ward’s team touting a friendly endorsement on her campaign website and social media. But political campaigns are notoriously overcautious about what they post on social media. Campaigns don’t normally highlight an endorsement from entities no one has heard of, especially when it launched just a few weeks prior. Politico noted that Ward denied any knowledge about the site on Facebook. Given that, there are two obvious questions: Is Arizona Monitor a phony news site meant to fool voters on Kelli Ward’s behalf? If so, who exactly is paying for it? We may never know who was behind the Arizona Monitor, as the site crumbled quickly after coming under scrutiny. Initially, it posted an article defending itself, but as I was writing this the website was deleted, as well as the site’s Twitter and Facebook pages. Local political blogs don’t generally operate this way; they relish being attacked by larger media outlets (the posture Arizona Monitor initially took) and do not disappear suddenly when attacked. Given its hasty exit from the internet, it’s not unreasonable to speculate that Arizona Monitor was some kind of front. FreeTelegraph.com resembles any of a host of hyperpartisan conservative websites that purport to share news. The website’s home page and articles emphasize social media sharing buttons and large photos; the pieces are brief and feature block quotes from other sources instead of original reporting or commentary. But while most right-wing hyperpartisan sites feature pieces supporting President Donald Trump and savaging his foes, FreeTelegraph.com employs a single-minded focus, with every article aiming to praise a Republican governor or gubernatorial candidate or criticize a Democratic one, with a particular focus on GOP targets in Virginia (24 articles), Connecticut (13), and Rhode Island (11). The website is still active. In Maine, the state Democratic Party recently filed a complaint with the state’s ethics agency alleging that the Maine Examiner, an anonymously owned news site covering Maine politics, made illegal expenditures in a local mayor’s race and that they might have coordinated with the Maine Republican Party as well. More recently, Politico reported that Rep. Devin Nunes (R-CA), apparently not content to let the NRCC handle his fake news needs, has a phony news site entirely paid for by his campaign committee. The website CARepublican.com, which Nunes refused to discuss with Politico, has a proper, if tiny, disclaimer but no other indication that it is a campaign website rather than an actual local news site or blog. Backer’s political fake news game is a whole new level, combining grassroots digital engagement with clickbait to build lists of supporters his super PACs can message and activate. Last week, I wrote about how Trump supporters share the most “junk news” online. Given that, it would seem predictable that Republicans would skip the middleman and just create the content themselves. Even better if they can use said content to raise funds for their political activities. But what might work for the Republican Party in the short term is terrible for democracy. A recent Knight News/Gallup survey found trust in media and views on what is or isn’t fake news was increasingly viewed through a partisan lens. Whereas liberals and Democrats get their news from more mainstream media outlets, conservatives increasingly rely on only right and far-right sources in their news consumption. 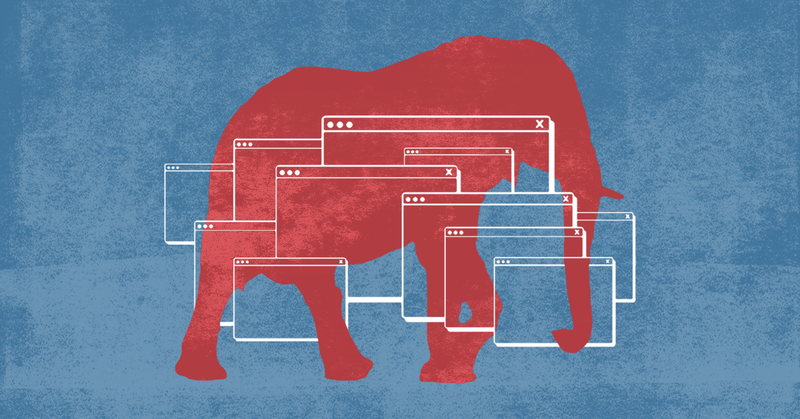 News sites -- run by the GOP about the GOP -- risk shrinking that filter bubble even further. If this trend continues, and phony GOP news sites increase in popularity, conservatives could reach a point where much of the political news they consume would come directly from the Republican Party and associated campaign committees. PolitiFact rated Fox anchor Gregg Jarrett’s claim that collusion with a foreign government in an election isn’t a crime “false,” citing three election law experts who named four statutes that could have been violated. Amid an FBI probe into whether members of President Donald Trump’s campaign colluded with Russia to influence the 2016 election, various conservative media figures have piled on to make similar claims that such actions -- if they occurred -- are not illegal. On May 10, Fox News correspondent Geraldo Rivera was among the first to say that collusion with the Russian government in an election wouldn’t be a crime. Fox host Sean Hannity said on his radio show on May 22, “Let’s say they did [collude], they said to Vladimir Putin, ‘Hey Vladimir, release everything you got.’ And Vladimir released it to Julian Assange. You know, is that a crime?” On May 30, Fox’s Jarrett asserted on air that “collusion is not a crime. … You can collude all you want with a foreign government in an election. There is no such statute.” Jarrett made a similar argument in a FoxNews.com op-ed. And on May 31, conservative author Michael Reagan claimed on CNN, “Collusion is not breaking the law,” and repeatedly asked “what law” collusion breaks. Nathaniel Persily at Stanford University Law School said one relevant statute is the Bipartisan Campaign Reform Act of 2002. "A foreign national spending money to influence a federal election can be a crime," Persily said. "And if a U.S. citizen coordinates, conspires or assists in that spending, then it could be a crime." Persily pointed to a 2011 U.S. District Court ruling based on the 2002 law. The judges said that the law bans foreign nationals "from making expenditures to expressly advocate the election or defeat of a political candidate." Another election law specialist, John Coates at Harvard University Law School, said if Russians aimed to shape the outcome of the presidential election, that would meet the definition of an expenditure. "The related funds could also be viewed as an illegal contribution to any candidate who coordinates (colludes) with the foreign speaker," Coates said. To be sure, no one is saying that coordination took place. What’s in doubt is whether the word "collusion" is as pivotal as Jarrett makes it out to be. Coates said discussions between a campaign and a foreigner could violate the law against fraud. "Under that statute, it is a federal crime to conspire with anyone, including a foreign government, to ‘deprive another of the intangible right of honest services,’ " Coates said. "That would include fixing a fraudulent election, in my view, within the plain meaning of the statute." Josh Douglas at the University of Kentucky Law School offered two other possible relevant statutes. "Collusion in a federal election with a foreign entity could potentially fall under other crimes, such as against public corruption," Douglas said. "There's also a general anti-coercion federal election law."